In a large pot, combine the first 7 ingredients. Bring to a boil, cover and reduce heat to low. Simmer for 20 minutes, stirring occasionally. Meanwhile boil the chicken in a separate pan. Add bean, corn and chicken to large pot. Increase heat to high until chili comes to a boil. Cover and reduce heat to low. Simmer for another 5-10 minutes or until barley is tender. If desired, top with shredded cheese, sour cream, and tortilla chips. Makes a huge batch! This was really good! My kids don’t usually like chili but it was more tomato-y instead of spicy. I used tomato sauce not salsa. I also used my own bottled tomatoes so I think it was a little runnier than was intended. 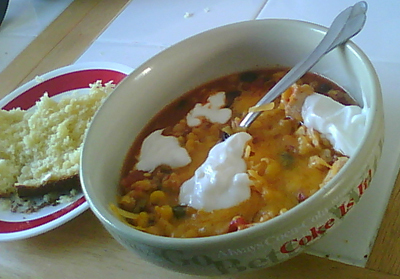 It was more like a thick soup instead of a chili. Now I just want to figure out how to altar the recipe to use regular barley instead of quick barley, since that is what i will be storing. I made a box of corn bread with this as I was short on time, but it would be GREAT with our buttermilk cornbread recipe. This recipe is modified from one found on the back of a Quaker Quick Barley box.